Italy is a dream destination for anyone who loves food and drink. With its intimate ambiance and delectable menu, Vincent’s is the perfect place to share an evening with your Valentine. Located just minutes from Apopka on 441, you’ll find homemade Italian dishes that are always delicious at a very affordable price. It comes as no surprise that February 14 just happens to be one day of the year to enjoy an evening out with your loved one. If you’re not sure where to go, visit one of the most celebrated dining venues in the area, Vincent’s Italian Restaurant, to ensure your evening is filled with delectable cuisine and a taste of romance. Their menu demonstrates a passion for knowledge and technique, with a special emphasis on freshness and true Italian fare. Be sure to start with one of their many mouthwatering appetizers, then select from a number of their tantalizing entrees. And, don’t worry, you won’t go away hungry after dining there. Be sure to indulge in their extensive dessert menu, which is the perfect sweet ending to any Valentine’s Day dinner. You’ll notice that the flavors brought out in the dishes served at Vincent’s Italian Restaurant are out of this world. Homemade sauces, meatballs, gnocchi, pizza dough, dressings, and desserts are full of flavor that only comes from authenticity and tradition. The homemade food and sauces served are second to none. The carefully crafted menu of Vincent’s showcases many of the signature dishes that have built a multitude of fans throughout Central Florida. It offers such favorites as chicken marsala and chicken picatta, shrimp scampi, calamari, seafood combo, and eggplant parmigiana along with their delicious pasta dishes, homemade signature pizzas, and salads. Italiano subs, salads and antipasto round out a fabulous, fast lunch menu. And, with a variety of price points, the selections allow for a dining experience that caters to each patron’s pallet and budget. If you are in a hurry or want to enjoy a wonderful Italian meal or pizza in the comfort of your own home, call ahead and place your order. Your meal will be packaged and ready for pick-up. And, if you love chicken wings, don’t pass these up. Fresh, plump, never frozen wings are also a favorite of the guests at Vincent’s Italian Restaurant. For Vincent, is has always been about the food. And, at Vincent’s Italian Restaurant, that is the focus. Creating a place where people can experience wonderful Italian cuisine and enjoy themselves with friends, family, and business associates has always been his passion. And, as a family, Vincent’s focuses on the thing that has always been most important to them, which is making each and every guest feel that they are part of Vincent’s family every time they dine with them. Vincent’s Italian Restaurant’s menu has a variety of pastas, authentic Italian main meals, and delicious pizza and sandwiches made with well-sourced, quality ingredients. Every dish has something to make it different, offering gourmets and fans an unrivalled experience coupled with a rustic, authentic Italian ambience. Each recipe comes from Vincent’s wonderful experiences that he drew from in Italy, from the hospitality to the authentic aromas in the kitchen and the homemade recipes compiled from his time in Italy. Vincent’s Italian Restaurant is a warm and comfortable restaurant that is the perfect place for your dining pleasure or special occasion. Vincent’s has been successfully bringing family and friends a taste of Italy for over 34 years! 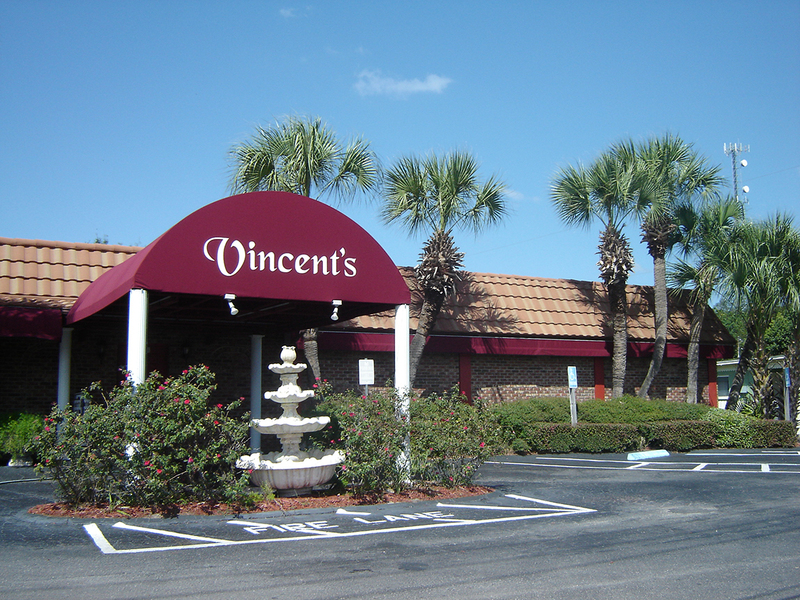 Vincent’s Italian Restaurant is conveniently located at 5914 North Orange Blossom Trail in Mt. Dora. Place your carry-out order by calling 352-735-4578. Visit Vincent’s Italian Restaurant Tuesday through Saturday, from 11 a.m. to 9:30 p.m., and Sunday, from 11 a.m. to 8:15 p.m. Vincent’s Italian Restaurant is closed Monday.